What is consciousness? Is the mind a machine? What makes us persons? What does it mean to aspire to human maturity?These are among the fundamental questions that Rowan Williams helps us to think about in this deeply engaging exploration of what it means to be human.The book ends with a brief but profound meditation on the person of Christ, inviting us to consider how, through him, 'our humanity in all its variety, in all its vulnerability, has been taken into the heart of the divine life'. 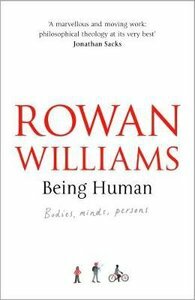 About "Being Human: The Call to Christian Personhood"
Rowan Williams(PC, DPhil, DD, FBA) is Archbishop of Canterbury, the highest office of the Church of England. Williams is a distinguished theologian and poet.He is the author of over twenty books including: Grace and Necessity: Reflections on Art and Love; Why Study the Past? ; Anglican Identities; Darkness Yielding; Writing in the Dust: Reflections on 11th September and Its Aftermath: Arius: Heresy and Tradition; Christ on Trial; On Christian Theology; Open to Judgement: Sermons and Addresses; and Resurrection: Interpreting the Easter Gospel.